As a fan of vintage sewing machines, I’m always on the lookout for vintage machines while out thrift shopping. 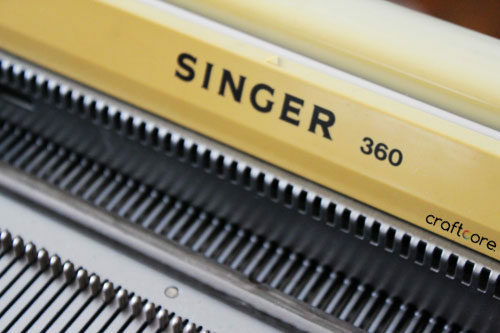 Earlier this year, I came across a set of mangled boxes in my local Salvation Army that featured the word “SINGER” prominently. It caught my eye since the bulk of my VSM collection are Singers. 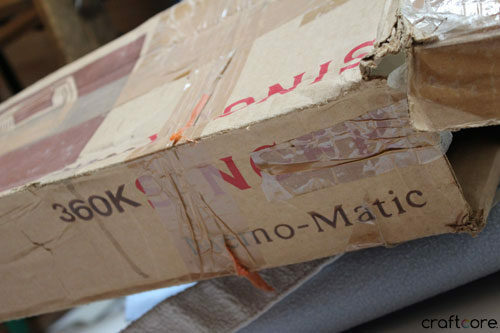 However, the main box was long and thin – no way was this a sewing machine! Upon opening, I realized that it was parts for a knitting machine, which I knew absolutely nothing about. Usually my knitting is done by hand, not by machine. I ended up taking the boxes home with me, wondering what I was thinking buying supplies for another crafty hobby that involves space-taking machines. I figured that if I couldn’t figure it out, I could always resell, so what would be the harm in giving it a try? The box was in very rough condition. Thank goodness for Styrofoam padding. All the parts seemed to be in decent shape. 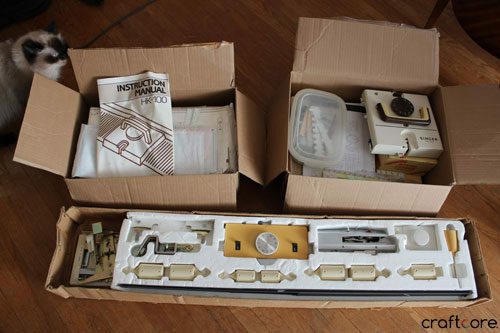 I turned out the knitting machine was actually two knitting machines (Singer 360K and Singer HK-100) and a knitting machine ribber accessory (Singer SRP-50). Jackpot! 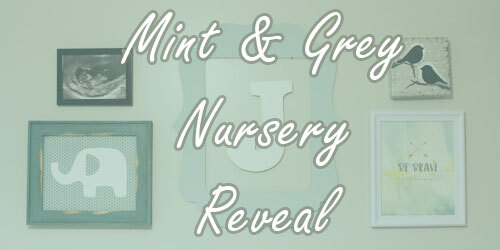 I have to admit, the unboxing was intimidating! There are so many parts and I had no idea what anything was. I’m thankful that the manuals were included. 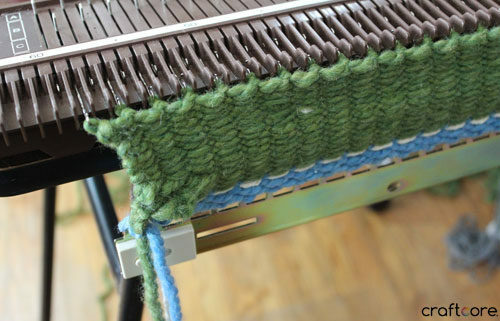 The knitting machines features a bed of knitting needles with a carriage that you drag back and forth that loops the yarn onto the needles. The machine clamps to the edge of any table. A row counter keeps track of your progress. 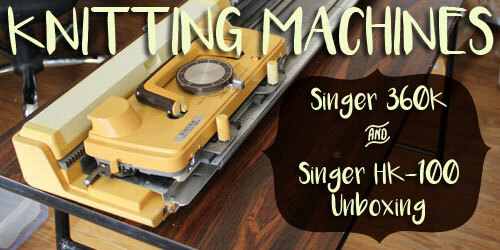 This machine, the Singer 360K, includes a punch card system to allow you to make designs with the yarn. There were some really cool punch cards included that I’m excited to try out. 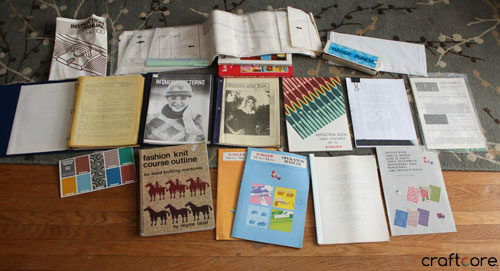 Luckily one of the accessory boxes included a bunch of knitting machine patterns plus all the manuals for the three machines. 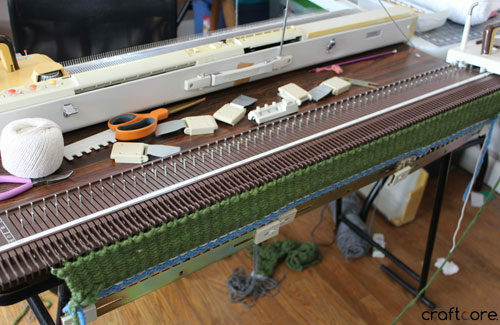 The Singer 360 knitting machine has a finer gauge compared to the HK-100. 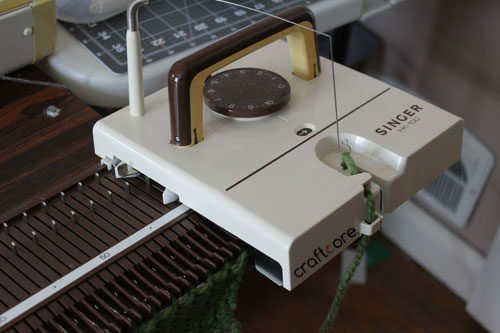 The second knitting machine that was included is much more simple than the Singer 360. It doesn’t have the punch card functionality. I personally find that running this machine is easier, but your mileage may vary. The gauge is larger. I set up the Singer 360 on one side of a table and the Singer HK-100 on the opposite side. I was able to get the HK-100 up and running more quickly than the 360. The learning curve for a knitting machine is much more difficult compared to a sewing machine! I have a lot to learn. Here is a sample test I did on the HK-100. 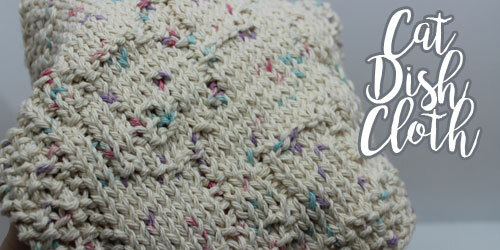 The yarn I used was much too bulky but I was able to see the general process. Here is a sample I made on the HK-100, every other needle. Not pictured on this blog post is the ribbing tool SRP-50 that clamps to the bottom of the Singer 360. As I experiment with these machines, I’ll share the projects that I complete. So far my husband has had more fun playing with these machines than I have, and he has completed several baby blankets. 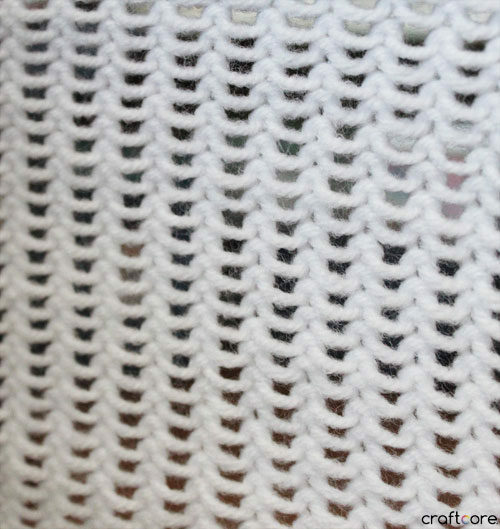 If you own a knitting machine and have any advice of great beginner projects beyond the standard rectangular blanket, please let me know in the comments! Hello, I have an HK-100 that I bought at a yard sale over 20 years ago. 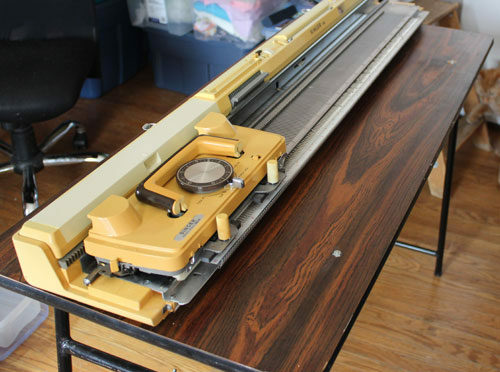 It is a non-standard 8 gauge for a bulky knitting machine. The Bond knitting machine is the same gauge. 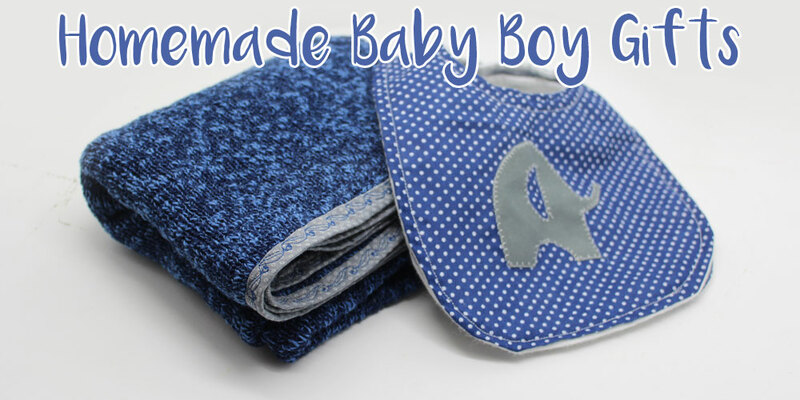 You can use Bond patterns, transfer tools and garter bars. Good luck and have fun. Hi Marlene! Thank you so much for the tip! I’ll be on the lookout for Bond accessories to use with my HK-100! My next step for the HK-100 is to replace the sponge bar to improve its performance. I too have purchased a Studio HK-100 through Kijiji for only $20 (score!) 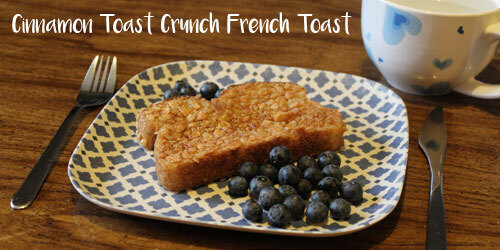 and will need to replace the sponge bar, where you able to find one here in Canada? 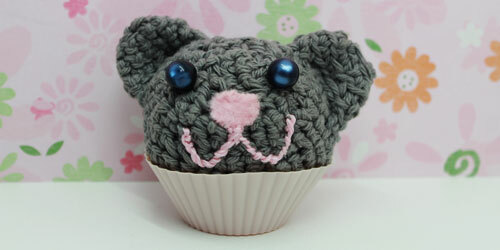 There is a lovely group called machine knitting on Facebook. They have been incredibly helpful in getting me up and running with machine knitting. I’ve joined the group and I’m loving it!